Experience the FUN and EXCITEMENT of a 5 Star Helicopter flight . Utilizing a sleek Eurocopter B2 helicopter, fully air conditioned with luxury leather seating for up to 5 passengers,** We provide set scenic tours, volcano flights and other iconic location destinations. Discerning guests might want to create their own custom charter flights, as we can cater to any individual requirement, such as marriage proposals, scenic picnics, transfers and many more options. Also provides a variety of alternative helicopter services, and as Bali’s only adventure company with its own operational aircraft, guests on all of the tours and services are covered by our fully-serviced air medical evacuation in the case of a serious emergency on any of our Tours. Taking a Helicopter tour of Bali is a privilege that few get to enjoy. This is the only way to see the spectacular Kintamani Volcano and Caldera lake, renown as Bali’s most famous landmark. A World class experience! 60 minute flight for up to 5 passengers. Departing from our own private helipads in Pesanggaran ( near Benoa ) or from Kedewatan, Ubud. Available every day from 7am to midday. ​Afternoons can be cloudy in this area. 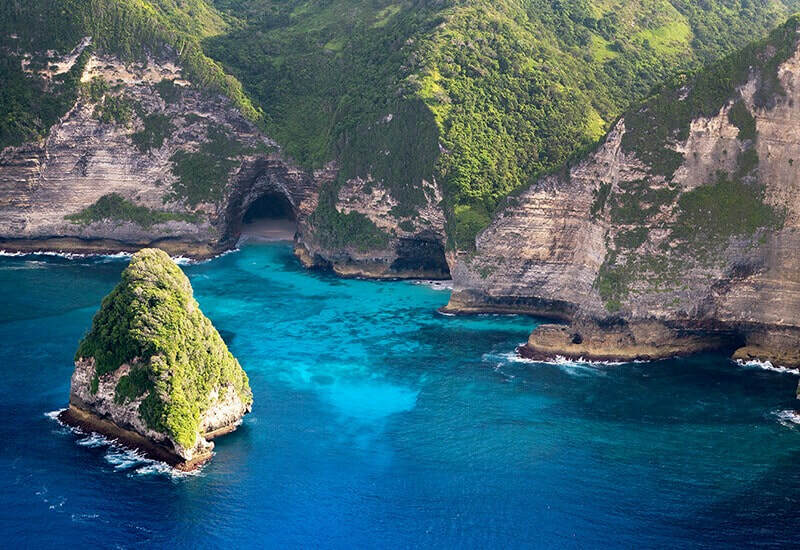 Get ready for an adrenalin filled 30 minute Joyflight around Bali’s beautiful Southern coastline encapsulating Dreamland beach, seaweed farms and the amazing Uluwatu Temple perched high on its towering white limestone cliffs. ​30 minute flight for up to 5 passengers. Departing from our own private helipads in Pesanggaran (near Benoa) or from Kedewatan, Ubud. ​Available every day from 7am to 4.30pm. ​In a caldera over 1200 meters above sea level, Bedugul is Bali’s famous mountain lake resort featuring a water temple and botanical gardens and close to the Bali Handara Golf course. 60 minute flight for up to 5 passengers. Departing from our own private helipads in Pesanggaran (near Benoa) or from Kedewatan, Ubud. One of Indonesia's major tourist destinations, known internationally for its long white sandy beach, and an iconic landmark for surfers the world over. 30 minute flight for up to 5 passengers. Departing from our own private helipads in Pesanggaran (near Benoa) or from Kedewatan, Ubud. The Hindu Temple of Tanah Lot, meaning 'Land in the Sea', is Bali’s most popular tourist and cultural icon for photography and general exoticism. The best way to see this amazing temple is from the air! Available every day from 7am to 4.30pm. 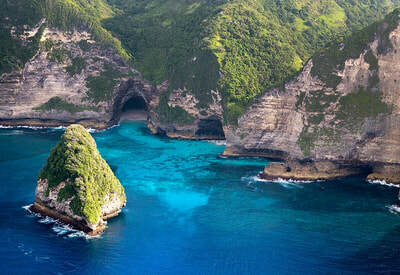 These two islands close to Bali offer a wealth of beautiful beaches blissfully free of crowds. Crystal Bay is famous for its white swathes of sand and aquamarine waters. Gili Trawangan is famous for a real tropical Island experience, with white sandy beaches and clear turquoise waters offering some of the best dive sites in Asia. 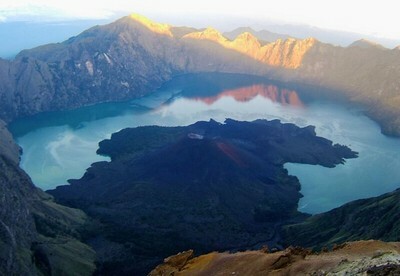 Mount Rinjani, on Lombok, is Indonesia’s second highest volcano and spectacular from the air. 45 minute flight (one way) for up to 5 passengers. Departing from our own private helipads in Pesanggaran (near Benoa) or from Kedewatan, Ubud. We also offer Customized Adventure Flights, fast Airport, Hotel and Inter-Island Transfers, Luxury Charter flights, Medical Evacuation, Aerial Photography and Filming, and we are the first company in Bali to offer aerial Banner Advertising. Using our onboard internal and external video system, we can record your entire flight ( available for an additional charge ).